Property owners considering remodeling projects frequently question roofing contractors about shingles. Do these building materials offer useful benefits? What advantages and disadvantages does shingle roofing entail? Today, roofs come in many varieties. Roofers sometimes use sheets of metal in installing roofs, for instance. Commercial buildings with “flat” roofs sometimes depend on the application of spray-on foams which harden and create a waterproof, durable, insulated surface. Rubber roofing may provide a popular choice in some situations. Slate or clay tiles also serve as roof coverings in some climates. Indeed, the specific selection of a construction material generally depends on the requirements of the individual building and the needs of the property owner. In the past, wooden shingles provided a popular home roofing material. The use of cedar shake shingles and other wooden roof coverings has declined significantly in recent years due to concerns about fire hazards. In areas where forest fires pose a risk, some builders have installed fire-resistant metal-based shingles resembling old-fashioned cedar-shake shingles. Asphalt shingles have gained widespread popularity as a residential roofing material throughout the United States. This durable building product continues to enjoy widespread use, although the composition of a typical asphalt shingle has changed over the course of time. Today, these shingles usually consist of fiberglass mats bonded with resin in addition to asphalt and minerals. The composition of the shingles contributes to the anticipated lifespan of the roof. 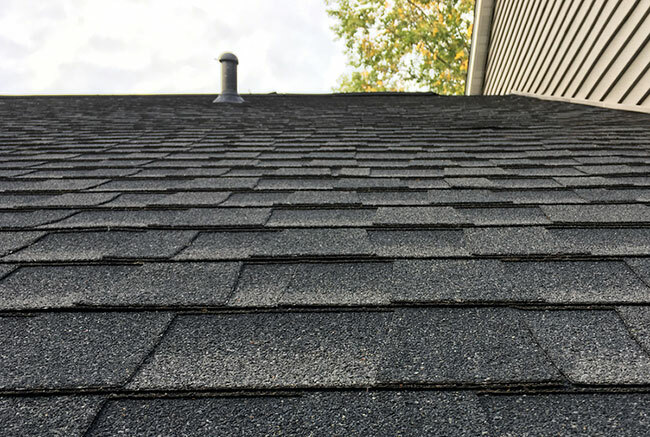 Depending upon the composition of the individual shingles, these roofs may last a considerable period of time; inexpensive shingles typically survive 15 years, with higher grade materials offering up to 50 years of service. Shingles permit easy roofing of dormers, porches, and other irregular architectural shapes. Old shingles sometimes crack and warp. Just like every building material, shingles offer both advantages and disadvantages. Working closely with your building contractor helps ensure you select the best roofing materials for your purposes!